There will be times during the film of Cloud Atlas—somewhere in the dense second hour—when you will recall that the dog needs to be walked and that you may have left the coffee on, and, whatever your age, even if life is an ocean made up of many drops, you may resolve that life is too short for this errant nonsense. I stuck it out, TNR, only for you, and because I wanted to delay as long as possible the desperate plight of actually writing about the film. In the third hour, I have to admit, the disparate parts of this self-indulgent venture do make gestures of coming together. Still, I suspect many will agree that the only emotional payoff comes in the credits. That’s when you realize that a strange cast of players take six or seven roles each over the centuries (and this film stretches from the 1840s to the twenty-second century, unless I missed something). One pastime to take you through the ordeal is to count the appearances—all routine and sub-par—of such actors as Tom Hanks, Halle Berry, Ben Whishaw, and Jim Broadbent. Still, the credits bring delightful surprises and the freshest response I could muster in nearly three hours. None is greater than the discovery of just how much Hugo Weaving does. He has six roles, I think, all worthy of his Agent Smith from The Matrix pictures, one of the most intriguing nasties in modern film, in a class with the mercurial Robert Patrick in Terminator 2. You will recall that the three Matrix films were made by the Wachowski Brothers, Laurence and Andy, and they took in box-office income of over $1.6 billion. Well, the brothers are brother and sister now (Lana and Andy) and that may have inspired the notion of how different people can look with some help from make-up (27 people are credited in that department, though Heike Merker seems to have been in charge). The Wachowskis actually accepted an invitation to work on the film from Tom Tykwer, the German who made Run Lola Run nearly 15 years ago and who then damned his reputation with The International, an exceptional hack job. Far-fetched as that triumvirate may be, the auteur behind Cloud Atlas is surely David Mitchell, author of the esteemed novel of the same name (published in 2004). Now, if you loved that novel, and I know people who did, you likely have dogs to walk, coffee to make, and the matter of life’s brief purpose to ponder, so don’t go near the film. I haven’t read the book, and I don’t think I could now, but there are flourishes of language in the film, let alone the very grand scheme of it all, that suggest the book is written. The film, meanwhile, has only been completed, or terminated. I’m not going to attempt to tell you the story, but I will just say that at one point a character admits, “This is out of control.” Don’t say the Wachowskis lack humor. There are various loci in the story, going from a slave ship in the 1840s, through the 1930s and the ’70s to scenes from Neo Seoul in the 2100s. That’s more Wachowski nudging, but I think they might have gone all the way and made it Neo Soul. 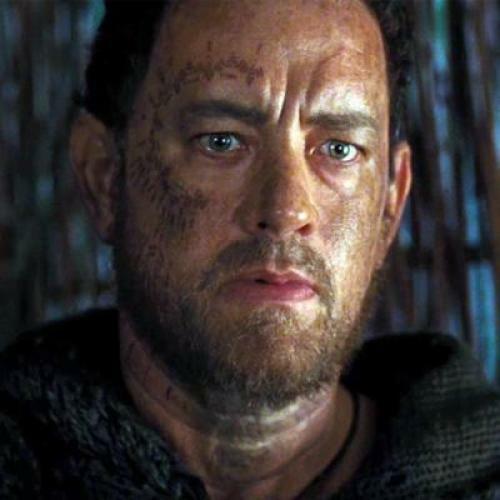 For a dauntingly long haul you don’t know where you are, and in a futuristic, post-apocalyptic sequence (or is it ancient pre-apocalypse) Hanks and Berry talk in a language all their own, one that seems to have been devised in a nursery. Yes, of course, this gargantuan aimlessness has a purpose: it is that in life all things hang together, that personalities persist through the ages and bad people can become good if they bear witness to love and truth. It’s so vague and stupid it seems worthy of Mitt Romney, but of course he hasn’t had three hours to spare in years, and for all I know he eschews the movies. The credits inform us that one Wachowski or the other, or Mr. Tykwer, directed different slabs of time. It’s a specious claim in that nothing seems to have been directed at all. This is no help to the actors, and here’s where a critic has to complain. There was a time when Tom Hanks was an actor with mischief and decency mixed together in his seoul. I daresay the two Oscars, for Forrest Gump and Philadelphia, becalmed him and let him assume that he was our everyman. But in fact he was lively and touching in two Spielberg films—The Terminal and Catch Me If You Can. Since then, he has followed one misguided trail after another: The Ladykillers, The Polar Express, The Da Vinci Code, Angels & Demons, Larry Crowne, and Extremely Loud & Incredibly Close. He is 56 now, and he is witless and wearying in this film. It’s as if middle age has destroyed the pretending gene in him. Alas, much the same has to be said for Halle Berry, who was compelling once in Monster’s Ball, but never again. Berry once had an authentic and reckless sexual energy on screen. Respectability has now descended on her along with the makeup. As for Jim Broadbent, he is a merry talent who is blithely slumming here. Ben Whishaw ought to be spanked and sent to bed early for a couple of years. He is a remarkable, fragile actor who will never have a large following—so give it up, Ben. Cloud Atlas cost $100 million, apparently. I hope Mr. Mitchell got as much of it as possible, and I urge him never to contemplate another movie in his life. There are two intriguing performances, one from Hugo Weaving, who is getting older, I fear, but who probably doesn’t need to be directed by the Wachowskis any more. The other is by Doona Bae, who is clever, touching, and truly comic, and whose character actually seems to believe in the purported message of the film. Nearly 20 years ago, the Wachowskis made a nice, toxic little B picture, Bound, with Gina Gershon, Jennifer Tilly, and Joe Pantoliano. It was rancid, hot and mean-spirited, and quite happy with that package. Alas, the Wachowskis are now determined to save the world with goodness. Resist.